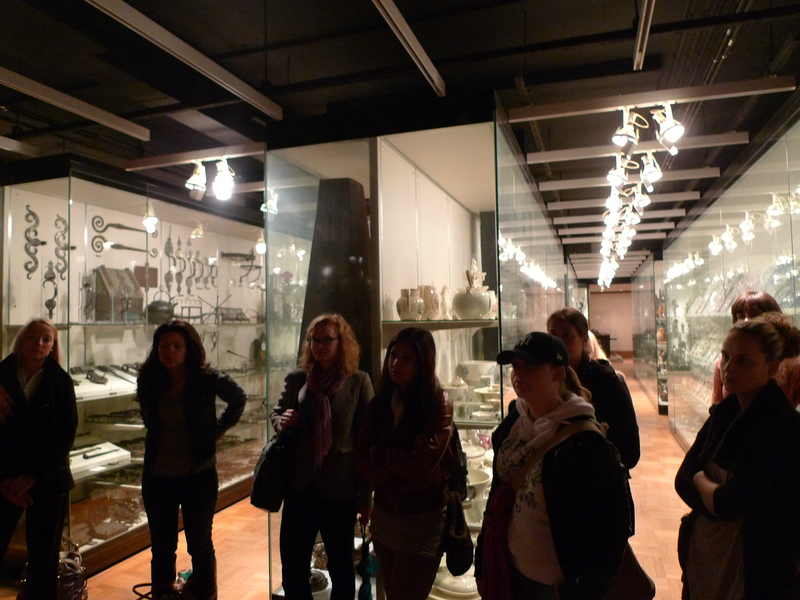 On Monday the MuseumLab visited the Henry R. Luce Study Center for American Art at the Met. Curator Amelia Peck and Technologist Leela Outcalt gave us a tour of the existing facility, talked about its history and showed us a prototype of the new user interfaces that they are implementing. The Luce Center was the first of many Luce Foundation funded study centers including the New York Historical Society, the Brooklyn Museum, and most recently the Smithsonian Museum of American Art in DC. The Met’s Luce Center was created in the late 1980’s when American became an official department after consolidating collections that were previously scattered across multiple departments. The Luce Center was revolutionary for its high-density open storage approach and use of digital object records that could be accessed by visitors. There are now over 18,000 objects of decorative arts, art and design in the American Department and these are distributed in a variety of gallery types including art galleries, period rooms, the study center, a recently renovated courtyard and some back of house storage. Adding loaned objects they are currently holding over 21,000 objects. The basic idea behind the study center was to democratize access to the collection, not just for scholars, but for the visiting public. There is a great article in Museum News (July 1991) by Carrie Rebora chronicles the early years of the project and how it came about so I wont dwell on the history here (I will digress with one footnote–the entire collections database and user interface ran on two 330 MB drives with 4 MB of RAM!). Amelia and Leela gave us their assessment of what works and what doesn’t and a peek at some new interfaces the are developing with Small Design Firm. Their plans include a much larger number of interactive study stations each with a large touch screen monitor at a table to support longer object browsing and study. The prototype of the new interface was quite sophisticated and allowed you to search using any field, and organize the collection chronologically, by accession date, and by material. They are also adding small monitors to the ends of each case, allowing users to browse the contents of the case in closer physical proximity. 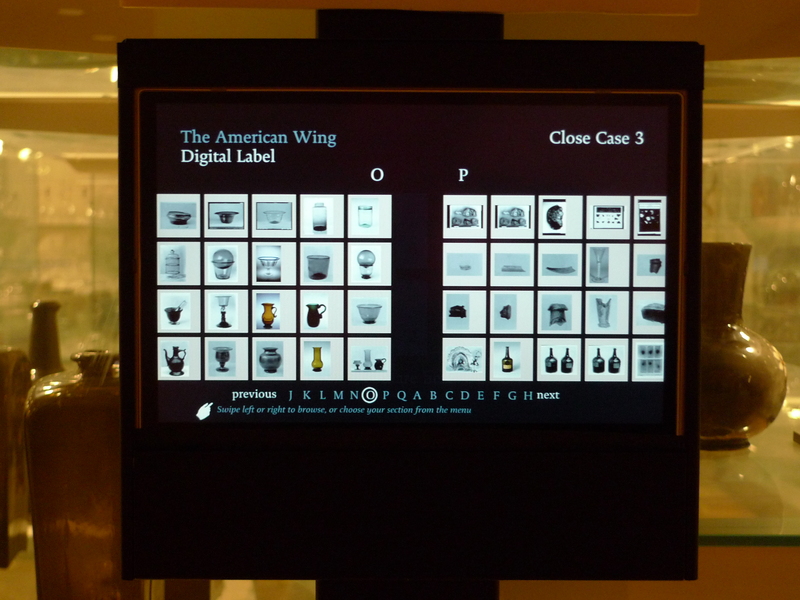 These compact screens are visually very simple and easy to navigate. Objects are represented as thumbnail photographs in a grid. Touching and object icon opens a page containing its metadata. The systems seems easy to navigate, is visually unobtrusive and is automatically updated with new data every week to keep pace with new acquisitions, loans and new curatorial information for each object. The Luce Center’s collections interfaces and the period room interactive programs are a smart technological retrofit of an existing facility and provide a strong contemporary complement to older (but still effective) exhibition techniques. To me the most interesting aspect of this interface is that it enables the Met to graphically represent the entirety of the collection in a number of ways that reveal larger trends like the proportion of objects in the collection across decades, or the proportion of silver, to glass, to ceramic, etc. These visualizations reminded me of some of the great Victorian collections displays where the entirety of the museum’s collection were visible in a kind of panoptic spectacle that was meant to convey the collection’s taxonomic structure at a glance. Edward Tufte is fantastic. If I had a log cabin I would go and read his books for days. After purchasing a film projector last week, I have immersed myself in watching TED talks projected large scale in my home. Also fantastic. 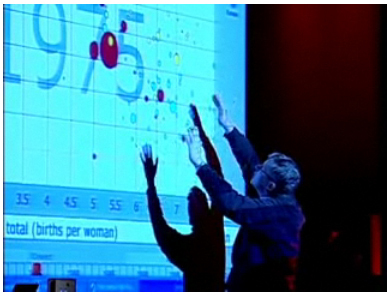 Hans Rosling’s 20 minute lecture on being able to visualize statistics is simple phenomenal. Countries are represented in circles of different sizes relating to population and are placed on an X,Y axis of health and wealth and Rosling animates the graph moving the placement of those countries on the graph as time progresses. We see countries evolving or failing. Reassigning the X,Y values, we see life expectancy rise up in most countries but literally see sub Saharan countries fall back with HIV-related deaths. Who know that watching moving circles could be an emotional experience – but it is. The bottom line is that so many types organizations have access to this data, but Rosling makes the point that this data is sitting in databases not being comprehended. While so many major global organizations can benefit from this instigating initiatives, museums can simply play the role of projecting this information for the public. Many of our conversations in class today concerned the museum visitor historically, a changing sense of “the self”, how this contributes to identity and the ways in which museums engage their audience. Our conversation widened to explore the role of social networking technologies and the issues associated with self-selection and collaborative filtering and how that relates to a museum’s function, its authority and the role of the curator. It is interesting to imagine that today people generally interact with a greater number of other people than at any other time in history. However these people are also far less likely to encounter someone who does not already share similar interests. One obvious conclusion is that we are in danger of losing the ability to be critical thinkers, to debate issues, and engage in rational conversations with consenting adults who disagree with each other. You can see evidence of this in our political news media. There is a great deal of emotion, no shared language, and next to nothing that opposing parties can agree upon. As CFM’s “Museums & Society: 2034” study discusses, self-selection has led to a polarized society where constituencies gather in safe clusters of like-minded peers, institutions and their content. Technology plays a role in this but it may be more of a symptom of something deeper than technology as an instigator. It is always easiest to blame the tool. This does not mean that social networking technologies are inherently bad. But they do reveal a tendency that is growing stronger and should be better understood in the context of museums. The idea of self-selection and the shaping of identity has a long history that predates Facebook and other applications by decades. In fact the shaping of identity in our political and commercial world is largely informed by psychoanalysis and its contributions to commercial marketing and public relations beginning in the late 1930s. At this time analysts began seeking a practical means of applying their science to the public at large. I recently saw a recent BBC production titled “The Century of the Self “which explores this history in four chapters. Its one of the most powerful and timely documentaries that I have seen. It is a must for anyone thinking about these issues. It is available as streaming media on Archive.org. Following a rough history of the museum in the posts above, what shall we say about the future of the museum? Hopefully the rest of this semester will cast some light on this and put forth some informed speculations. When imagining the future one can really only talk about current trends and, if they show signs of continuing, to project how they might shape our world. 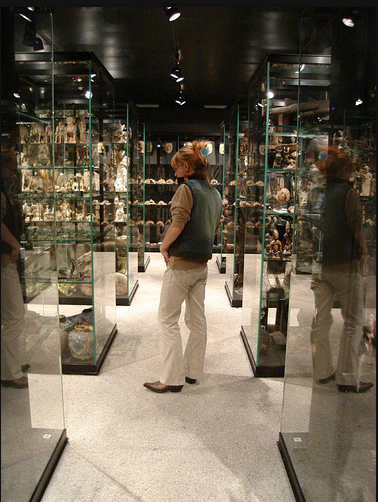 Throughout history museums have followed changes in society and evolved to suit its needs. It is safe to guess that the increasingly rapid changes in society (technology, energy, education, economy, etc) will precipitate a need for museums to adapt sooner than later. In fact the existing museum models do seem a bit tired and are hard-pressed to keep up with and address a range of social and technological issues that are already in play. 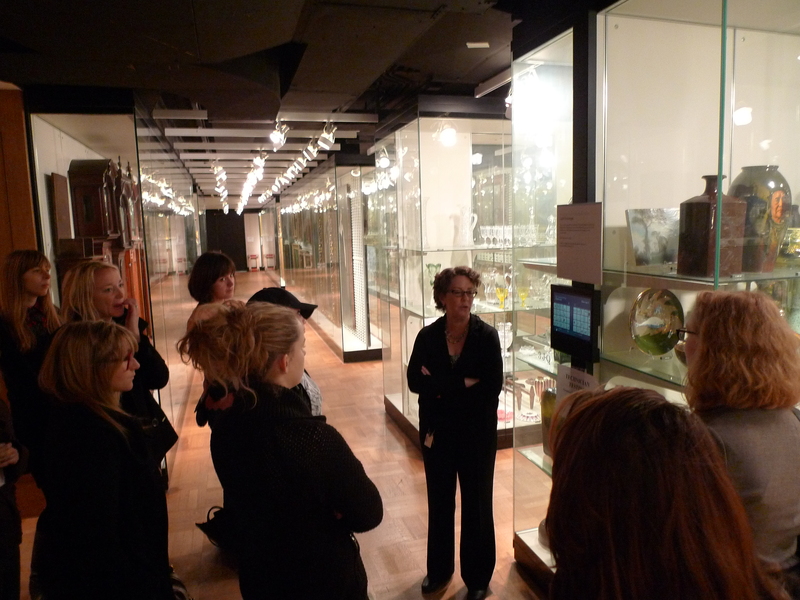 Thanks to a wide variety of thinkers in the museum community, some initial ideas are emerging. We know that the museum of the future will have to recognize a world that is connected by a complex and constantly shifting network of influences, a disappearance of temporality and a sense of self that is shaped more by the social networks we inhabit moment to moment than by any singular defining experiences. Through collaborative filtering, users of Web 2.0 applications talk to more people than any generation before them but are less and less likely to meet someone who does not already share similar interests. We are by default all members of special interest groups. In fact each of us likely has multiple identities that inform our sense of self. Some of these may even conflict with one another. Museums already find themselves no longer serving categorizable audiences but micro-constituencies which take form and disappear with a speed that is impossible to respond to in traditional mediums. We are all simultaneously curators and consumers. Content is generated by the user on-demand and the proliferation of free content via the internet has changed they way a younger audience perceives cultural value in a museum. Thinking about a new model for the future of the museum does not suggest we abandon the object or “the real” and supplant these critical assets with technology. But it does suggest that the new mediums and experiences of a generation who know the world through social networks and new tools must come into play. However to understand these new “Networked Publics” [ed. Varnelis] we should not look at the technologies but look more carefully at the desires of the society that gave shape to and created these technologies to serve its needs. Some major influences on my thinking here include the recent work of historian and cultural theorist Kazys Varnelis, who is the director of Columbia University’s Netlab, Nina Simon who perhaps coined the term “Museum 2.0” with her notable weblog dedicated to the subject, and Dr Angelina Russo who presides over a weblog titled Museum 3.0 (perhaps trumping Nina, or maybe just because Museum 2.0 was taken). All three are amazing thinkers and far more qualified scholars than I am. I have also been reading AAM’s Center For the Future of Museums’ recently commissioned study “Museums & Society: 2034” and The New Media Consortium’s “2009 Horizon Report” which forecasts the adoption of emergent technologies in public space. I will summarize those in a future post.